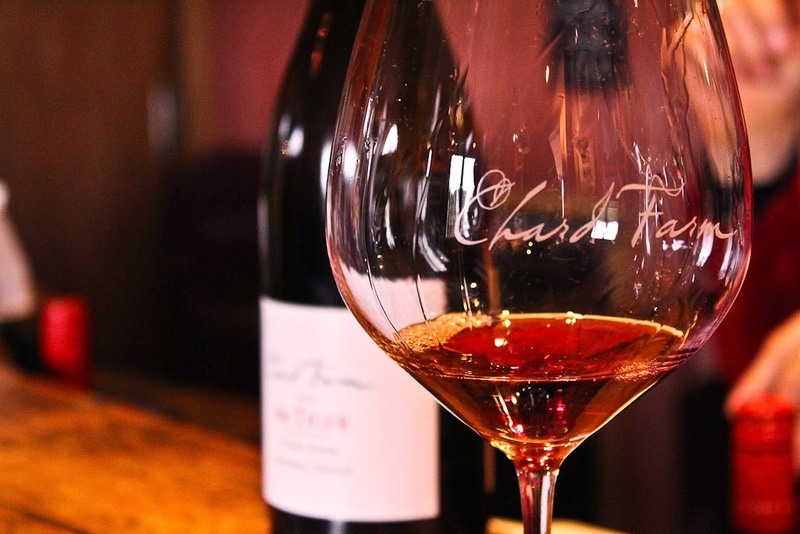 Chard Farm’s Pinot Noir tasting. Snow-capped craggy mountains, cold steel-blue lakes, and impatient rushing rivers are typical landscapes you would expect in New Zealand’s Central Otago region, home to the tourism hot spot of Queenstown. Fortunately for wine-loving travellers, Central Otago is world renowned for its Pinot Noir, and also produces some great aromatic white wines. The hot summers and cold winters combined with minimal rainfall and free draining soils make for excellent grape growing conditions. If you visit in summer, you’ll likely be treated to hot, dry, sunny days, with a scorched landscape all around. In winter, snow often covers the ground and the cellar doors with restaurants offer tables next to roaring fireplaces. Visiting the region in any season is a delight, and it’s great that the cellar doors (otherwise known as wine tasting rooms to US folks) are open year-round. View over Central Otago’s mountains near Queenstown. 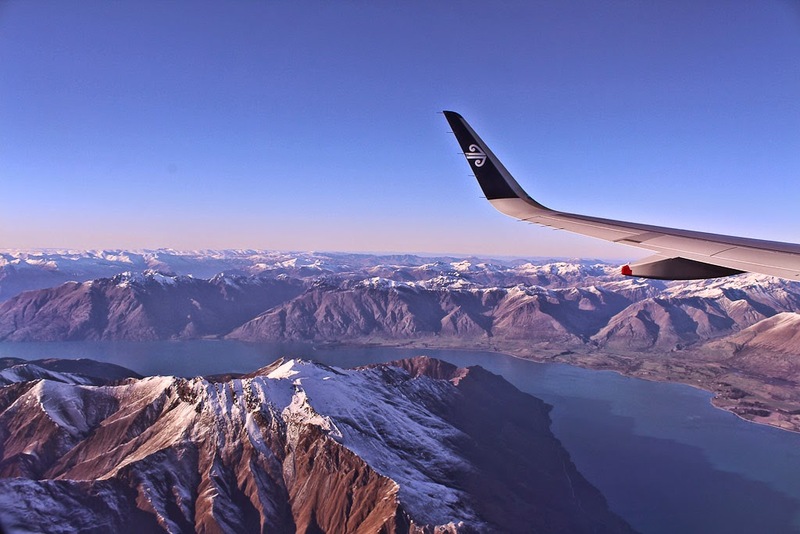 As New Zealanders, we have been lucky enough to visit Queenstown and the surrounding region numerous times. Every time we go there we end up taking numerous bottles on the plane back home, and so do the majority of the passengers. So here is a list of our five favourite cellar doors within one hour’s drive of Queenstown. You’ll need a rental car to visit all these places, as public transport just doesn’t cut it. There are wine tours available with a pre-determined itinerary but we recommend going at your own pace and enjoying the journey (but just remember to allocate a sober driver). Rules on the door at Chard Farm. 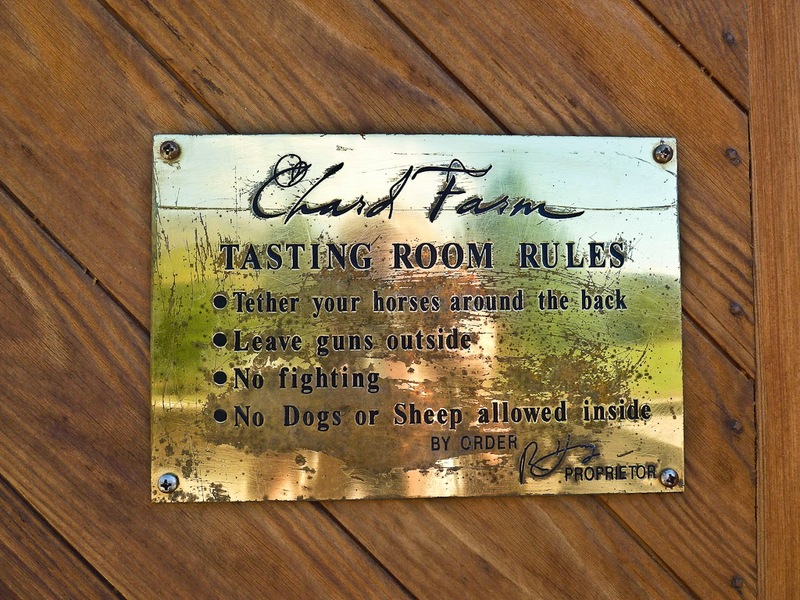 Chard Farm Winery is our all-time favourite. We love all of their wines, but particularly their outstanding Pinot Noir – the Viper, Tiger, and Mata-Au varieties are all superb. Their aromatics are also divine, in particular the Gewürztraminer. The people running the cellar door are so friendly, you really feel like you’ve stepped into someone’s home. Chard Farm is located at the end of a rather hairy road along the Kawarau Gorge – it’s one car wide and has a cliff on one side and a sheer drop to the river below on the other side. More than one car has tumbled off the road, so be careful! But when you get there, it’s totally worth it. The cellar door and restaurant at Amisfield is beautiful – think huge old wooden beams in a church-like building, a roaring fireplace in the winter, and of course amazing wine. The Pinot Noir is fantastic and we also love their Riesling. The restaurant serves lunch and dinner, and we recommend trying the excellent Trust the Chef menu – you get five courses to share, made from local, seasonal ingredients. You can also get the meal paired with different wines if you so desire. A wintry view from Mt Difficulty Wines cellar door and restaurant. Mt Difficulty is located in the Bannockburn region of Central Otago, near the town of Cromwell. 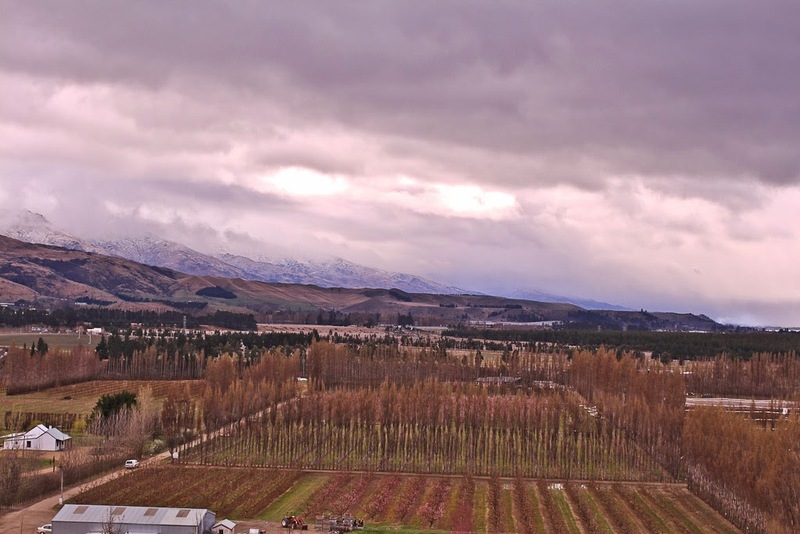 The view from their restaurant and cellar door is stunning, as it looks towards mountains and over the vineyards and stone fruit orchards on the flats around Cromwell. It’s well worth stopping in here for lunch and a tasting – you won’t be disappointed. Their Pinot Noir and Pinot Gris varieties are superb. Gibbston Valley Winery is located near Chard Farm and also alongside the Kawarau River. Their Pinot Noir is tasty, and the cheese on offer at the shop on location is delicious (and goes down very well with their wine). They also offer tours of their vineyard and wine cave, which is dug into the hill behind the winery. It’s fun seeing all their barrels with the current vintage aging away, and doing a tasting inside the cave. A word to the wise – this is a stop for tour buses, so if you’re wanting a busy winery experience this is a great place to go. Northburn Station’s winery is part of a high country sheep station on the eastern shores of Lake Dunstan, near Cromwell. The cellar door is housed in a beautiful stone building with pretty views over a pond to the mountains beyond. Northburn’s Pinot Noir and Sauvignon Blanc are a hit, and they also offer delicious platters full of local goodies (cheese, meats, olives, terrine, and more). Delicious! The cellar doors will ship across the world so those amazing wines don’t have to remain only a memory once you return home. With its awe-inspiring scenery and fantastic wine, as well as plenty of other activities to keep you busy, a stay in the Central Otago region is a must for any visitor to New Zealand. 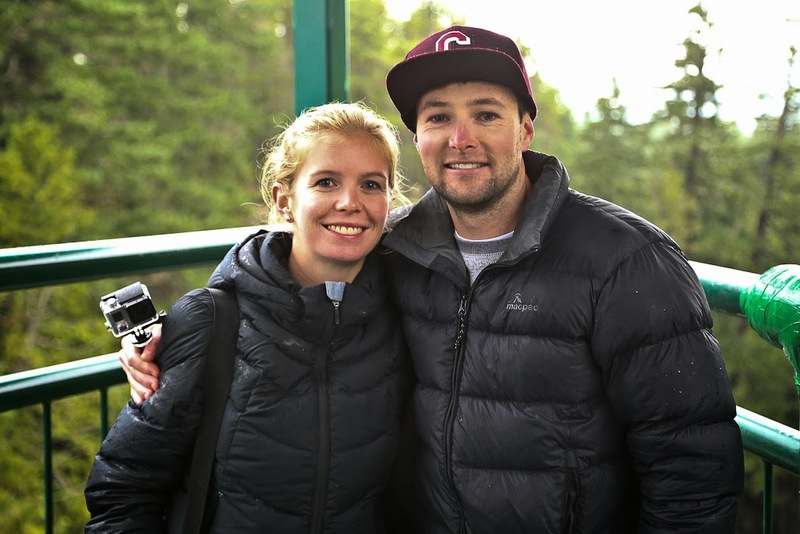 Petra and Shaun are two mid-20s New Zealanders who currently reside in Vancouver, Canada, but their hearts are in Southeast Asia and they would love to live there some day. On their travels they aim to understand and embrace different cultures, histories, customs, foods, and landscapes. Their blog The Global Couple is a collection of their travel tales and photography, but also contains travel tips, road trip itineraries for New Zealand and the US, and city guides. Follow them on Instagram and Facebook.